I was given a copy of "Faversham Paper No. 64 - Beowulf in Kent", which makes the case that the events of Beowulf took place around Faversham. As much as I would personally wish this were true (my grandfather was born in Coastguard's Cottages, Conyer), the evidence given is extremely poor, not even bordering on circumstantial. To the casual reader, the ideas put forward might appear tantalisingly convincing but in my opinion, they lack credibility due to inadequate referencing of the essential points given as evidence, translation errors and plainly wild assumptions. The paper postulates on page 3 paragraph 1 (3.1) that the Isle of Harty, now fused to the Isle of Sheppey, was the site of 'Heorot', Hroþgar's hall and that it took its name from the main settlement there. The author further goes on to claim (without reference) that the island was called 'Heorot' in the 11th Century. This is incorrect. Neither Harty nor Sheppey were named after a settlement, but their functional use in the dark ages: When keeping livestock safe (remember wolves and other carnivores were present in England at this time), an enclosure with a predator-proof wall was essential. Sheep were kept in a 'scippen' while stags (providing protein-rich venison) were kept in a 'heortpen'. Much better, if you were a coastal tribe, was to remove all predators from an island and store the livestock there as the stretch of water around the island would keep the livestock in and the predators out. The suffix 'ig', pronounced 'ey', means simply 'isle' in Old English, thus 'sceapig' (Sheppey) means Sheep-Isle, and 'heortig' (Harty) means Stag-Isle. In both cases, the place where livestock is kept safely, the Swale (OE: sualuæ - rushing water) keeping any predators at bay. A factor which is not considered by the author is the spelling of 'Heorot' in Beowulf which is accepted in its meaning of 'heart' or 'stag' although in most Anglo-Saxon manuscripts, stag is usually spelled as 'Heort'. This is because in addition to the meaning of 'stag', 'Heorot' is also a kenning, made up of the elements 'Heo' and 'rot', meaning 'Hall of Cheer' or 'Cheerful Hall'. How the dark ages name 'Heortig' can mutate from 'Stag Isle' in the 6th Century to 'Cheerful Hall' in the 11th century to 'Stag Land' in the 15th and back to 'Stag Isle' in the 19th, is not adequately explained by the author. At 3.8, the author places the date of Beowulf at the middle of the 6th century. This is not categorically possible without bringing in associated data from other contemporary manuscripts, which would additionally confirm the scandinavian location of Beowulf, for example the saga of Hrolf Kraki.Taken alone, even the earliest historical association might still be interpreted as a grafting of later date to maintain relevance to the contemporary listener, in the same way that we know later Christian graftings to have done. The author contends that Beowulf's homeland was around the mouth of the Rhine (5.1). According to the poem, Beowulf was a member of the 'Geatas' or 'Götar' tribe, most likely from Västergötland but possibly, though less likely, he was from Östergötland. There were no Geatas/Götar settled at the Rhine estuary. The author appears to feel that the time for the journey between the Rhine and Sheerness is proof of this point, basing his deductions on timings of Roman vessels given by Plutarch (5.1) and the British Admiralty North Sea Pilot's assumption that during the Pax Romana, merchant sailing vessels would have made landfall at either North Foreland or Sheerness. This is also in error because it assumes that a migration period vessel of the dark ages would have taken the same route as a merchant sailing vessel of the Pax period. 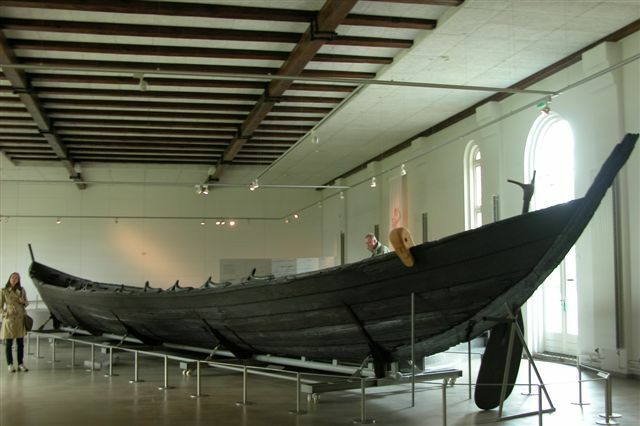 The type of boat that would have been used by Beowulf would have been similar to that which was discovered at Nydam Mose. Analysis of this boat's construction has shown that at top speed, it would have been capable of 8 Knots, while in casual rowing, a speed of 5.5 knots was attaianble. A 36 hour journey (a day and a half as losely deduced from Beowulf) would constitute a 90 to 190 mile voyage, placing both the postulated Västergötland embarkation point, Göteborg and the postulated Östergötland embarkation point, Oskarshamn within easy reach of Zealand, the widely accepted location of Heorot. Therefore, unlike the Pax period Romans, the migration period boats that came from the Rhine would not travel straight from the estuary to Sheerness, but would coast from the estuary to a point where England became visible, somewhere near Calais and then quickly cross to land somewhere near Dover. This would mean that the 'Shining Sea Cliffs' first seen by Beowulf (if the Rhine postulation was correct) would be the White Cliffs of Dover and not Sheerness. However, since the first view of Dover would be uninterrupted chalk cliffs, this hardly agrees with the described view that Beowulf had of 'sea-cliffs shining, shores steep and broad sea-nesses'. On the other hand, the two postulated landing sites on Zealand (the accepted location of Heorot), both exhibit these features. The shining cliffs (5.3-4) bears no significance since many forelands exhibit this feature and most notably, both the postulated Zealand landing locations: Klintbjerg and Mendehoved show this effect. Ic hwile wæs endsæta, ægwearde heold, þe on land Dena laðra nænig mid scipherge sceoðþan ne meahte. 'endseat' is a lookout seat, while 'ægwearde' literally translates as 'eye-watch' but means 'guardian' not 'warden'. Interestingly enough, there were no Danes in Kent, not even after the settlement of the Danelaw (middle of the 9th century), yet this quotation states that the area being watched over by the coast's guardian, is the land of the Danes. The author's conviction that there are Danish placenames in Kent which confirm his theory (8.6) is flawed. Considering that Anglo-Saxon and Danish originate from the same Germanic root language, there are bound to be similarities of words, though meanings may change. The example that the author gives is the Norse 'gata' which he defines as meaning street, and gives rise to the names Scrapsgate, Clapgate, Dargate, Ramsgate and Margate. However, in Kent, the gate derives from Anglo-Saxon 'geat' which means 'an entrance into', giving rise to the modern word 'gate' but was also equally used to mean a 'port' for shipping. Is it coincidence that all of these 'gate' names happen to be sea-ports during the dark and middle ages, one would suppose not. Most telling in the author's view is the name of 'Nagden Bump' which he believes derives from the Norwegian 'Nagge' meaning 'point'. This to is incorrect. The word Nagden, derives from Old-English 'Nægen' meaning 'Approach' for reasons which will become clear later. ...þæt ða liðende land geseon, brimclifu blican, beorges steape, side sænessas. ...that the limb's end of land they saw, sea-cliffs shining, hills steap, wide sea-nesses. indicating a Roman road like the one on the Isle of Harty. This assertion is made on the assumption that no one else made stone roads and there were no Romans in Denmark to build roads, making the stone paved road uniquely English. Stone paved roads are common however in Denmark and were being built during the stone-age, for example the Broskov Road 30 miles from Lejre the accepted location of Heorot. Since archaeological evidence shows that Vikings were also building stone roads, there is no reason to suppose that stone road building ceased during the migration period. The author is also at fault with his conviction that the point where the English Channel spews into the North Sea, must be the Swan Road of Beowulf. There are very vew migratory swans, but those that do migrate do not cover this area. The map given to the left, shows migration routes of swans (red) across Europe and as can be seen, none of the routes covers the North Sea - English Channel confluence (shown in purple), which is the area postulated by the author to be the crossing point of Beowulf. This area can not therefore be considered as the Swan Road. On the other hand, the migration routes of Bewic Swans from Yorkshire to Finland and Sweden, both cross both the postulated areas of Beowulf's sailing. Consequently the Baltic Sea and the Kattegat can both be considered as the Swan Road. oþþæt hy sæl timbred, geatolic ond goldfah ongyton mihton. No one would presume that the outside timbers of the hall were decorated with gold and so this may merely be poetic metaphore to demonstrate an influential king. 'Fagne flor' is important to the story however as it accentuates the effect of Grendel stepping into the hall and polluting the finery with his foulness. 'Fagne' (coloured) was probably the only adjective that the poet could alliterate with 'flor'. A corollary to this is recent archaeological evidence dating to the 800s, that Vikings paint-washed their wood with a yellow ochre, which may account for the description of gilded timbers and coloured floors. As the constructions of mystical beings from the past, neither the Saxons, nor the Britons would go near them, so they crumbled untouched back into the earth. It is because of this that most Roman ruins are in relatively good condition for us to excavate today. Finally, there is absolutely no evidence in the archeological reports that the Roman buildings on Harty or Sheppey were occupied subsequent to the withdrawal. In fact there is no evidence of this anywhere in England other than cities, which were generally raised and rebuilt as the archaeological evidence of London, Canterbury and York indicate. Whereas Wealhþeow was more than likely a wife arranged as part of a peace-deal, her name in Beowulf being a compound of 'Wealh' meaning 'foreign' and 'þeow' meaning 'hostage/servant', it is certain that she would not have been a Briton. According to the saga of Hrolf Kraki, she is identified as 'Ogn' the daughter of 'Noðri' the king of Northumbria. Since Northumbria was divided into two kingdoms; Deira and Bernicia, both kings of whom claimed kingship over the whole of Northumbria, it is uncertain which kingdom is being referred to. Other evidence (which will be described in another article) indicates that Noðri was king of Bernicia. In all likelihood, Ogn was a marriage pact between Hroþgar and Deira and as such was a foreign hostage/wife or Wealh þeow. What is certain is that she was Germanic in origin, not Briton or Celtic. A Celt would have only been considered as mistress-fodder, not wife-material. Nagden Bump was demolished to reinforce flood defences in the 1950s. During the demolition, it was verified not to have been a tumulus, but a raised mound on which to burn a beacon as a guide to shipping. The possibility that the mound originally contained a Roman lighthouse which was later robbed out, was not discounted, its being a tomb was. The name 'Nagden' appears to confirm this in that the Old English word that it derives from 'Nægen' means 'approach' and the presumed purpose of the hill for a beacon or lighthouse would make the hill an approach for shipping. It can not therefore have been Beowulf's tomb (8.7). Additionally Beowulf fought Grendel and Grendel's mother in Hroþgar's kingdom. When he fought the dragon, he did so in his own kingdom, died and was buried there. Nagden bump, if the rest of this argument is to be believed, should automatically exclude itself as Beowulf's tomb since it would be in the wrong Kingdom and should therefore be by the author's reasoning, somewhere near the Rhine estuary. and it still goes on today. There is a Kent in Connecticut, in Maryland, in Michigan and in Minnisota. There is nothing to say that the placenames in Kent weren't named after locations told of in the poem of Beowulf, simply to remind the settlers of their connection to Scandinavia and the events of the story. It would be foolish however to claim the events happened in Kent purely because of the similarity in placenames for the same reason it would be foolish to claim that the Battle of Hastings took place in America because Harold marched his troops down Watling Street and there is a Watling Street and a Hastings in Minnisota.